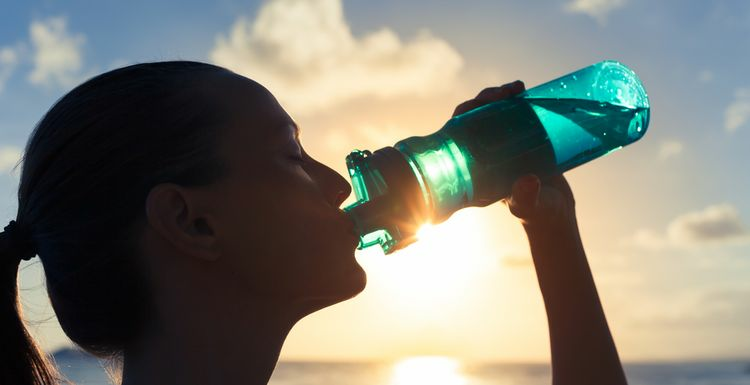 FORGET SPORTS DRINKS –WATER IS THE MOST IMPORTANT LIQUID TO PUT IN YOUR GYM BAG. At the most basic level, without water, you will die. It’s that critical. It’s the building block of life, as we know throughout the universe. Water carries all the essential stuff like oxygen and fuel to our cells, and flushes out all the rubbish. Your joints are lubricated and your temperature kept steady. Feeling peckish? Try a glass of water first. Studies show that some people confuse hunger with thirst. You may also reduce your appetite by drinking plenty of water, helping you resist cravings for unnecessary junk food and snacks. In a recent study, participants who were dehydrated were less able to tolerate having their feet dunked into ice cold water; they were able to keep their feet in much longer if they had drunk plenty of water beforehand. The more water you drink, the more awake you’ll feel. This is because dehydration can eat away at core bodily functions which sustain and energise you throughout the day. During resistance training, water is driven into muscle cells, creating the ‘pump’ sensation. But poor fluid consumption, often exacerbated by sweating, makes your body preserve water for more essential functions like circulation, leading to a reduced pump. If you’re going to buy a drink, water is your healthiest choice. Lots of other beverages, such as sports drinks, creamy coffees, shakes and smoothies have added sugar, stimulants and minimal nutritional benefits so only drink them in moderation. If you want to knock years off your looks, water is your best friend. Deprived of hydration, your skin develops cracks in the cell walls that make it look dry and wrinkled, as well as letting in infections. Staying hydrated is the easiest, cheapest way to maximise your exercise performance. So keep a bottle handy when you next go to the gym, drink throughout the day, and make your own vitamin water if you are getting fed up with H2O! Michael, tea and coffee are better than nothing but they can dehydrate, so aren't the best choice for meeting that 8 glasses a day. That said, it is quite personal - as long as enough is coming out of the right colour, we can assume enough is going in! I easily drink 2 litres a day and can't understand people who say it's really hard. Remember one mugful is at least 250ml so it's just 8 of those a day, and that's including tea and coffee (I think).